In November 2008, a little over a month ago, I attended a workshop held by The Nocturnes, a group of photographers that specialize essentially in night-time photography. They generally go without any or very little artificial light such as street lights, cars, etc, though a Nocturne will use flashlights and other tools to add to an image in some cases. There are lots of examples of ultra-long exposure shots (4 hours is the longest I’ve seen, 1 hour is the longest I’ve done). They have a flickr group as well, and a pretty useful discussion forum. 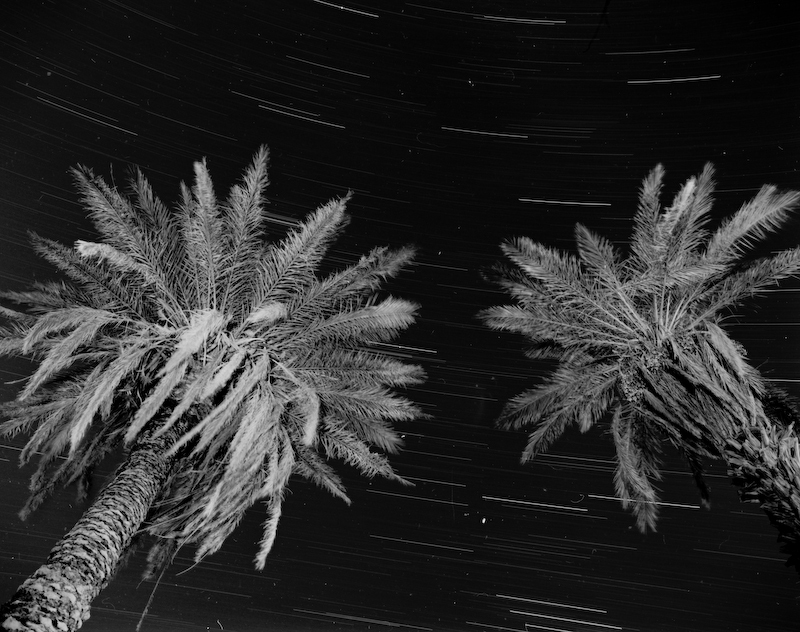 Nocturnes tend to be pretty intense – many shoot only this type of photography, and they have developed calculators for correcting for these long exposures, etc. Many shoot enough to just know how long to expose for, just based on experience. The workshop I attended was from November 8-10, when the moon was getting to full (76% when we arrived, 92% when we finished). We were at the Furnace Creek Ranch, one of only two real places to stay in Death Valley, the whole time, they though we worked several locations, including the Furnace Creek Inn, Zabriskie Point, Badwater Basin, andthe abandoned town of Rhyolite just over the border in Nevada in addition to the ranch itself. The workshop was led by Tim Baskerville, a Nocturne veteran (one of the first) and a great guy. Overall, I give this workshop an experience a very positive score. It was a small group – 6 of us – and we shared some good tips and comraderie. Not as much as I would hope among all 6, but, in addition to the one good friend and one acquaintance I already knew, I can think of at least one other person with whom I spoke and interacted quite a bit. So that’s not bad. And I did get a lot out of it. Working with the light, understanding how working in just moonlight vs. a mixed lighting situation vs. daylight was very different, and I became more comfortable with the uncertainty of this type of photography. But also the wonders of the results. The full flickr set of my photos is online. I will admit that I messed up a lot of the color exposures, though the black and white turned out better. However, I do feel that some things could have changed. 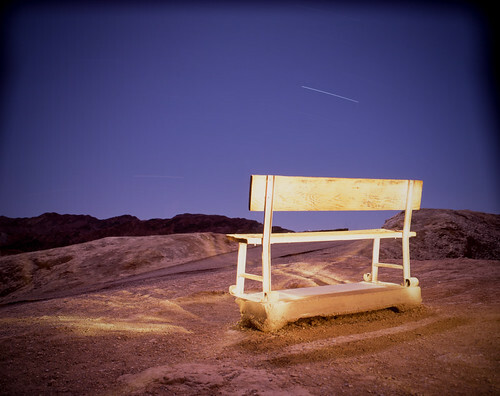 If one has not done really long exposures…as I have not, the first night can be very disconcerting. I asked Tim at one point if, in the particular scene we were shooting, if he would basically look around, judge the lighting and, based on years of experience with his film, estimate his exposure. He acknowledged in the affirmative. Now, to someone new to this and a Type A personality, this is a very difficult response to receive. Basically, he has this huge base of knowledge upon which to draw, and I’m expected to somehow cobble about 2 hours of lecture into photos that will have at least educational meaning to me. That’s asking a lot. And I was very uncomfortable that first night, figuring that I was just wasting film and wasn’t going to learn anything. By the time the second night came around, I felt a lot better. I think this was because I was working more with just moonlight – no mixed lighting – and because I accepted that I might get terrible results. Who knows with film. But I do think some things could have been changed to make it a better workshop. First, I would spend less time on the history of night time photography. Just some iconic photos ranging from Stieglitz to Kenna (and everyone in between, of course), and some examples of the differing techniques used (light painting, all natural, etc). We spent at least an hour going through three trays of slides which almost put me to sleep. Also, more structure would have been nice. I would have required all participants planning to shoot film to use the exact film with which Tim is most familiar, so that he could tell us an exposure to use and work more on our technique, how to “see” in terms of long exposures, to get comfortable with the times knowing that he had all this experience, etc. Then go off with our own preferred film from there. Finally, and to be honest, I am not sure if the workshop really got us into anywhere that we could not have done ourselves. In fact, I bet a big chunk of the $595 fee was to cover the permits. 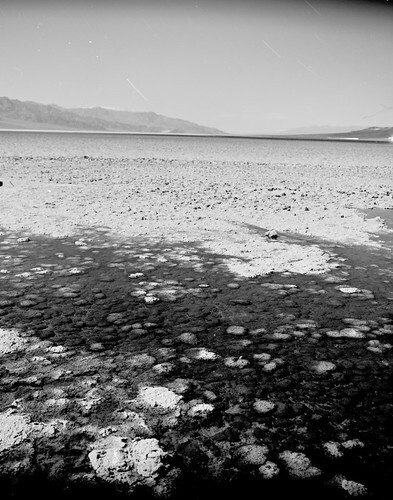 But Badwater Basin, the lowest point in North America, is open to the public, as is Zabriskie Point. 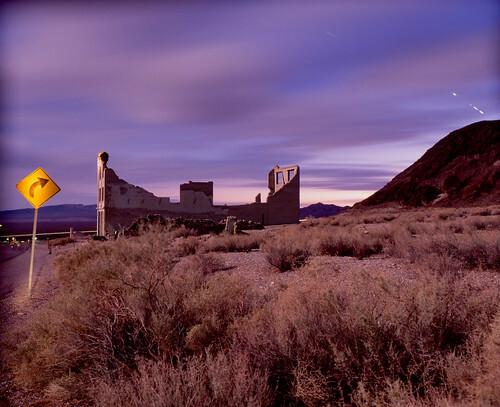 Rhyolite technically needed a permit but Tim admitted that he didn’t have one. So I wonder how much we could have done on our own. Overall, while I enjoyed the experience, I would not recommend this workshop, under its current structure, to others.